I’ve lost count of how much Canon equipment has arrived at the AP office of late. Beneath my desk I’m creating what seems like a tower of empty Canon EF lens boxes and the latest one to add to this pile is the huge box for Canon’s latest telephoto zoom – the Canon EF 100-400mm f/4.5-5.6L IS II USM, which was announced back in November. This is a lens that I’m particularly interested in for a number of reasons – not only am I intrigued by the new design and Canon’s decision to switch from the push-pull operation of the zoom to the twist type, I happen to own its predecessor, which for me has been a regular and reliable performer in my bag for the past seven years. Out of the box, the lens feels of similar weight and size to the older 100-400mm f/4.5-5.6 L IS USM, however on the scales it’s actually 260g heavier. Compare it up against another popular Canon zoom – the EF 70-200mm f/2.8 L IS II USM – and it works out at being just 150g heavier. Why all this talk about weight? Well, one of my main concerns before heading out with the lens was whether I’d need to pack my monopod or not to take some of this weight off my shoulder. For security’s sake I packed it alongside the EOS 7D Mark II before heading along to Doddington Gardens – the home of the Hawking Centre and my chosen location for testing the EF 100-400mm f/4.5-5.6L IS II USM. The first shots taken with the lens look superb on the rear LCD. Opening the aperture to f/5.6 and zooming in beyond 250mm realises the potential of being able to create beautiful background bokeh. Sharpness levels look extremely impressive, as you’ll be able to inspect for yourself by clicking on any of the sample images above. Autofocus speeds are right up there too. I found it capable of attaining focus in a heartbeat and managed to shoot a number of pin-sharp shots of birds in flight as they flew directly towards the lens with my AF sensitivity set to Case 3 on the EOS 7D Mark II. Hasten to add, I had the EOS 7D set to its maximum shooting speed of 10fps for a majority of the day to increase my chances, though I’ll be the first to admit I shot a number of blurred frames – often the case when photographing such high-speed subjects. As for the zoom’s operation, it took a bit of time to get used to the twist motion having been used to the push/pull motion of its predecessor for so long. The friction control ring that’s located just behind the zoom ring stiffens up the operation of the zoom to prevent it creeping, but as I discovered, the zoom didn’t show any sign of creeping whatsoever even when the friction ring was set to its minimum. As for my monopod, it didn’t come out of my bag once. Unlike larger and heavier telephoto zooms the EF 100-400mm f/4.5-5.6L IS II USM can be carried over the shoulder for long periods and felt almost identical to carrying the EF 70-200mm f/2.8 L IS II USM attached to a similarly sized body. The only thing I would have liked is a larger plate attached to the lens collar. As it is, the supplied plate is on the small side and doesn’t allow you to wrap your hand around it to carry it easily. 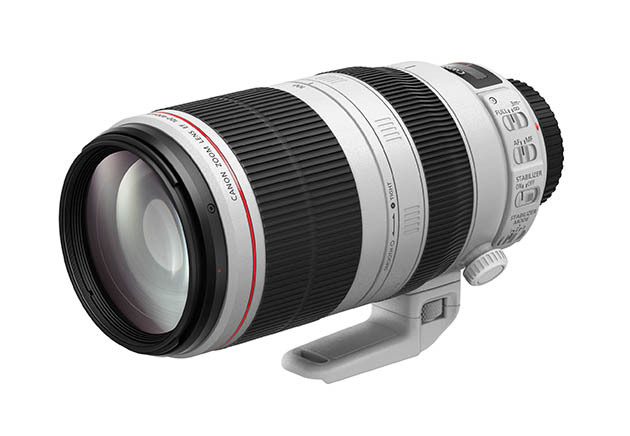 Canon looks to have succeeded at producing one of their best zooms to date with the EF 100-400mm f/4.5-5.6L IS II USM. When it comes to packaging the lens up and sending it back I’m certainly going to miss it. For our full verdict on the performance and image quality, look out for our in-depth field test coming soon.